Global Kids works to develop youth leaders for the global stage. My name is Nsilo Mavour, and I am a youth climate activist. Two years ago I joined Global Kids, a nonprofit educational organization, and together with 30 other teens, we birthed the idea that New York City could take a stand and tackle climate change, this century's most pressing issue. As New York City public school students who live in front-line communities that have experienced the ravages of climate change, we believe it is our right to be educated on the science of climate change. When lawmakers in states like Wyoming and Oklahoma try to cast doubt about climate change in their schools' science curricula, climate-change education is a necessity. In a country where big oil and fossil fuel company interests have drowned out the voices of individual citizens, climate change education is a necessity. When 97 percent of the scientific community agrees that climate change is a product of human activities and that it is a significant threat, but only eight out of 278 Republicans in Congress believe the same, climate change education is a necessity. We, students from Global Kids and the Alliance for Climate Education, understand this necessity, and we are taking action. We created a campaign that asks for mandated climate education in all New York City schools in grades K-12. We wrote petitions and gathered thousands of signatures supporting climate education. We participated in the People's Climate March and the UN Climate Summit. We reached out to our elected officials. 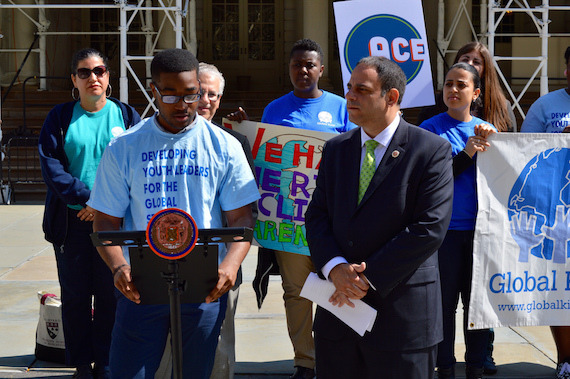 New York City Council Members Costa Constantinides and Donovan Richards heard our call and introduced New York City Resolution 0375-2014, proposing climate education in New York City schools. This resolution is a step in the right direction -- a step that will prepare young people to be better leaders than the ones we have today. This is merely the beginning. Join us in celebrating this Earth Day by advocating for climate education!